Defeating the impressive Lynn Bulldogs 47-45 in the sub-state championship game on Saturday, the Lady Cardinal basketball team is state bound! 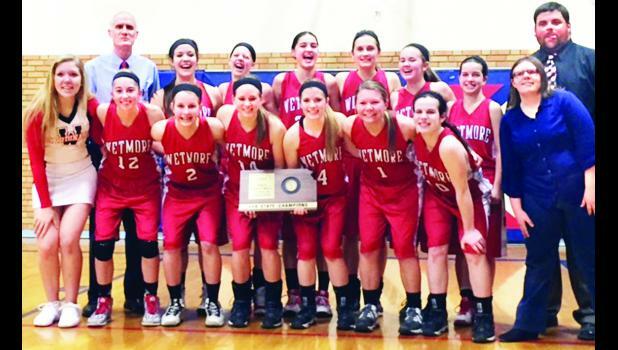 The Wetmore High School team will travel to Dodge City to play Beliot St. Johns/Tipton in the Class 1A state tournament’s first round of competition on Wednesday. The game against the Cardinals and the Bluejays will begin at 3 p.m. at the United Wireless Arena in Dodge City. Coached by Perry Smith and Harlan Suther, the 12-member Wetmore team includes: Seniors: Keri Pfrang and Corinne Haverkamp; Juniors: Gerae Haverkamp, Elizabeth Hutfles and Ryley Martin; Sophomores: Dakota McQueen and Rachel Bloom and Freshmen: McKayla Henry, Jill Henry, Myrna Crismas, Jossie Shumaker and Jade Brown. Robyn Potter is the team manager. “This is an extraordinary group of ladies, and the entire town is proud of their efforts,” said Wetmore principal Janelle Boden.